2.5 fl. Oz. The applicator is a small tube with a roller that is supposed to dispense the liquid quickly and easily without any mess. This product is messy. The roller does not evenly the liquid inside the tube so sometimes it will give a big glop of liquid in one place and in others leaves nothing. The ball has a tendency to get stuck and quit rolling around so it sometimes requires the use of fingers to get moving again which leaves this nasty smelling analgesic liquid all over your fingers which does not seem to wash off. 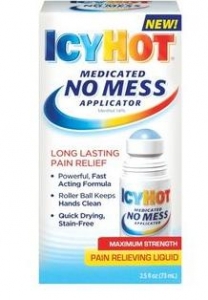 This product does have a smell typical of that associated with an analgesic liquid so everyone around you knows that you are wearing Bengay or Icy Hot and it is embarrassing to smell that way. it on my fingers (because the roller ball was stuck) and accidently touched my face. I would much rather stick to the patches because they do not smell, they do not burn and aside from not staying in place, they do not have that many side effects. I do not like the medicated applicator and what relief it gives I can get from a patch without the smell, mess or burning.